Named after the street where our studio resides, the Nowita sand candle is sustainably sourced, waste free, and environmentally conscious. Not to mention fun to look at– turn out the lights and watch it glow! The Superba is our triangle sand candle that appears to float effortlessly above the table! Organic, textural and functional, a perfect mix of simple ingredients and thoughtful design. These ceramic dishes were hand thrown and glazed in Venice by ceramic artist Patrick Johnston, exclusively for Washed Up. Offering two glaze options– at the nice price, while supplies last! We're proud to be offering our new spice jars, handmade by longtime local artisan John Mooney! Each jar is individually crafted with blue bubbled glass and sealed with a natural cork stopper. Beautifully balanced to avoid tipping. 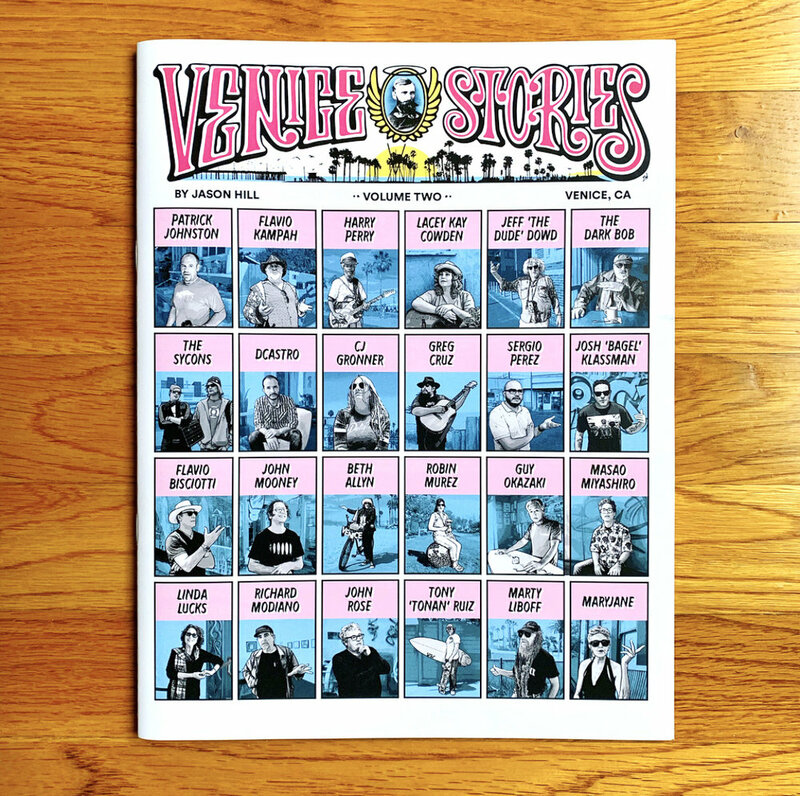 Venice Stories Volume One is back in print! The first 25 stories are collected here, featuring Venice Beach history and interviews with local personalities. Available exclusively through Washed Up, this new Venice Stories anthology collects the second set of stories from the series, featuring Venice Beach history and interviews with local personalities. These hand strung necklaces are made with 100 year old vintage blue glass trading beads with white fishbone beads strung on natural grey hemp thread. Limited edition. Now offering these hand strung necklaces, made with 100 year old vintage blue glass trading beads, white oyster shell and blue panyas seed beads, strung on natural white hemp thread. Very limited edition! We are proud to offer this original photo of skate legend Jay Adams by Venice photographer Josh 'Bagel' Klassman! This recently discovered image from the mid 1980's sat undeveloped and unseen for 30 years, now available for the first time here at Washed Up Venice dot com! Original artwork by Jason Hill, printed on metallic paper! 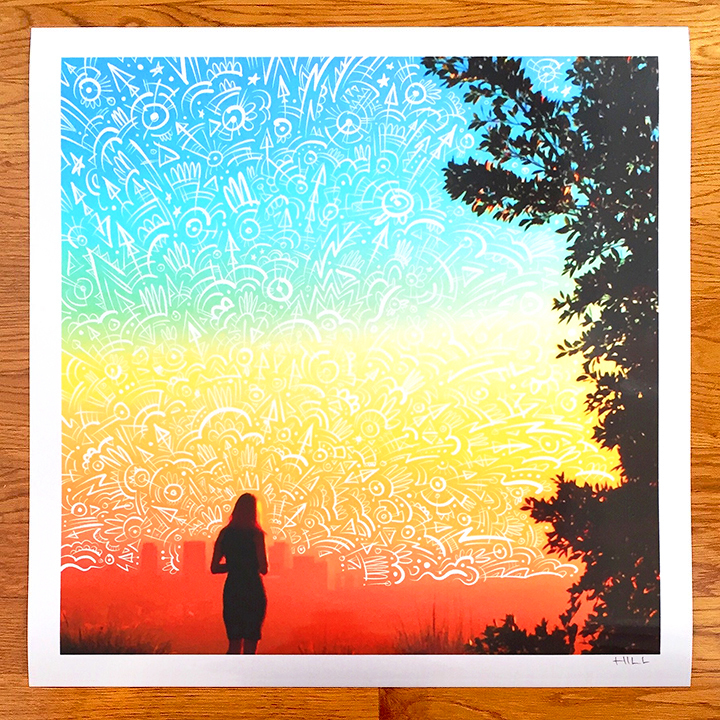 Jason's photograph of a spectacular Los Angeles sunset, embellished with his distinctive freehand style. This is an exclusive release on Washed Up and limited to only 10 signed and numbered prints. These original, hand-printed artworks by Venice muralist and printmaker Francisco Letelier were hand-dyed blue exclusively for Washed Up and are limited to only five rice paper prints! This is an original, unframed 'Stardust' Dreamscape painting of the Venice Art Walls by artist Jason Hill. Jason's photo of Venice Beach at sunset has been printed on metallic photo paper and finished with hand painted silver stars. This Cuban strain produces beautiful pink flowers and broad sticky leaves for harvesting. These are open-pollinated, non-GMO, organic, homegrown seeds, packaged with instructions in a handmade envelope. This handmade booklet is filled with pre-creased pages to hold Rorschach inkblots of your friends signatures. Ask your friends to sign their name along the crease, then fold in half to create a 'ghost' print and reveal their inner spirit!